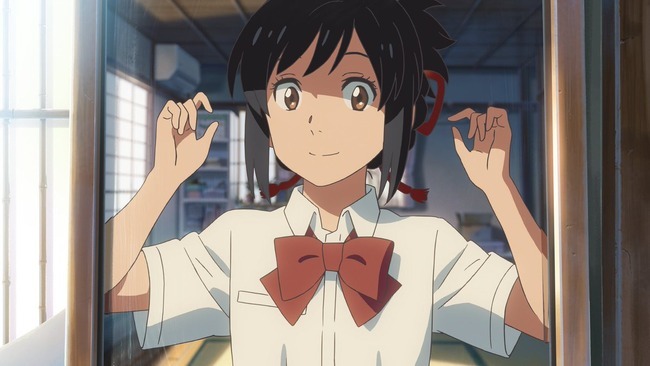 Now, this should be obvious to anyone who has looked at the posters, but Kimi no Na Wa is a love story with a heavy emphasis on fate and red strings and yada yada. The main characters live in different parts of the country, and though they have an emotional connection, it’s difficult for them to physically meet. When the guy gets on a train to meet up with the girl, his friends ask him if he’s trying to meet someone he met online, because that’s what it looks like to them. Having an emotional connection to someone you’ve never physically met… yes, that is an awful lot like an online friendship, isn’t it? It sounds almost spiritual when you put it that way, even though it’s actually mundane. But that feeling was what made the film relatable for me even when the most melodramatic stuff was happening. I mention this because I first watched Kimi no Na Wa with people I had met online through Twitter. We’d met in person multiple times by then, so we don’t really think of each other as “online friends” anymore. But I can still remember the first time we met, how it was like meeting an old friend for the first time. Actually, two of my friends fell in love with each other through their online interactions, and now they’re dating. So I’m sure they must have seen a bit of themselves in Taki and Mitsuha. As for me, watching the film for the first time made me experience all kinds of emotions, but most of all I found myself feeling happy for my friends after the movie was over. Although I myself have never fallen in love with someone I’ve never met, I could recognise it happening around me, and I felt humbled by the strength of those emotions. Even if it’s not “love” in the romantic sense, the relationships I have with people online are definitely real, aren’t they? 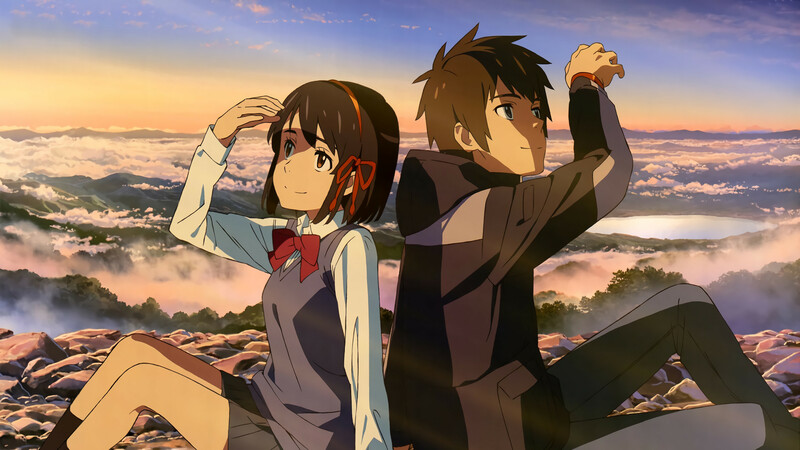 Watching Kimi no Na Wa made me want to meet all the internet people I have a relationship with, however fleeting. Because I know that these feelings are real, I don’t want them to be swept away by the flow of time. I think that’s what Kimi no Na Wa was about. On English Light Novels, I contributed some titles for the Light Novels for Beginners feature. On Paste Magazine, I helped facilitate Adam Nizam’s interview with kouri, the creator of the RM2K horror game Ib. On Wave Motion Cannon, I translated a discussion between Yoshiyuki Tomino and Yoshikazu Yasuhiko. I also checked karice’s translation of an interview with Hiroshi Kamiya. On ATMA & Funomena, I once again checked karice’s translation of an interview with the sound director of Yuri!!! on ICE. On Anime Feminist, I participated in a roundtable discussion about “trash” characters in anime and manga. On The Canipa Effect, I translated part of an interview with Eiji Inomoto, the CEO of Studio Orange. Oh well, I’ll think of something. I’ve been taking life as it comes, and it’s been suiting me just fine! Aaaaand that’s all I have to say for this update. Take care, everybody! Posted on November 30, 2016, in Editorials and tagged ib, kimi no na wa, your name, yuri on ice. Bookmark the permalink. 20 Comments. Thank you for the non-spoilerey thoughts! A pleasure to read them, as always. I’ll get around to watching the film sometime, though given my current location, I have no idea exactly when that will be. Like you, I’m not a huge Shinkai fan. The visuals in his work are never anything short of spectacular, but his work also tends to leave me emotionally cold – I remember thinking that about Garden of Words especially. That said, I’ve been informed by a ton of people now that Your Name delivers on an emotional level as well as a visual one, so I’m very eager to find out for myself if that’s the case. Well, good news for you! Your Name will be screening in New Zealand starting from December 1st… which should be today in your time! Do make time to see it in cinemas, since I don’t think the experience would be quite the same on DVD or even Bluray. And if you watch it, let me know what you think! Unfortunately, I’ll probably have to wait quite a bit longer than that. I’m currently living in Thailand – and not a major city either. So I’m guessing I’ll be waiting until March at least, which is when I plan on heading back to Japan. Shucks, didn’t know you were in Thailand at the moment. Hope you have a good time there! It’s… a mixed bag, shall we say. I came over in October and I’m here at least until my contract finishes at the end of February – though I may stay on a week or so after that just to travel around a bit. I never actually thought about it like that it was good of you to bring it up. I wonder whether Shinkai came up to this concept precisely because of the increased connectivity we have with people all over the world in our era. If that is the case then Shinkai is an ambitious man. I remember thinking about what you pointed out here–online friends and meeting them offline–when I first watched the film. And going to see it again yesterday, I found it stood out even more because I was able to better understand the framing (e.g. the ‘present day’ bookends that I was a bit puzzled by the first time I saw it). I feel like Japan has always had stories permeated by that “red string of fate,” but the way Shinkai connected it with a world so familiar to us seems to be one of the reasons this film resonates so much. One other thing I realised, though, was that I might have preferred watching it dubbed rather than subbed. Because I wanted to focus on the visual storytelling, I found the subs waaaay too distracting and had to try my best to ignore them! Yeah, I don’t think I would have related to the film as much if it was just a story about fated lovers. I also found the way it was framed as a response to the Fukushima disaster interesting, and found myself comparing it to the perspective offered in Shin Godzilla. I can’t elaborate here because of spoilers, but I think it would be interesting to write about. Also, you watched Kimi no Na Wa for the first time in Japan, right? How was it compared to the Aussie experience? Was the crowd much different? And most importantly, was it enjoyable for you the second time? It’ll be good to see you tackle that comparison one day! Hm…since it’s been over two months already (!! ), the details are fuzzy now. It’s difficult to compare the crowds because of the days I went, even though it was a mid-day screening for both. In Japan, I went on ladies day, so the cinema was quite full even though the film had been out a month. There were a lot of women, and I remember seeing quite a few with tears in their eyes as we all walked out. Here, I went on student’s day, and the theatre was maybe half full, and I’d have said most were probably anime fans. We didn’t clap at the end, sadly, but more than half of us stayed through the credits. So it’s doesn’t seem to be doing quite as well here as it is in the bigger Aussie cities, but I hope it’s doing alright. Congrats on getting to watch that movie. it’s good you enjoyed your time. Children who get caught up in an over-complicated retelling of a Ghibli tribute to the Orpheus myth… Huh? my brain hurts! He did Hoshi no Koe, That’s enough to secure him a place in awsomeness. Did you catch the hat-tip moment to it in Pacific Rim? WhoooooHaahh! I await your full spoilerific treatment of Name. In the final rift battle, the heroic duo’s Jaeger has only one arm left, engages ‘sword’ and does the long rip through from the underside of the kaiju-thingy. I think the heroine is primarily responsible. I’ve heard a few comments that suggest Shinkai could become the next Miyazaki if he refines his storytelling further. Shinkai himself has refuted these statements saying he’s nothing compared to Miyazaki, but do you personally think Shinkai has the capability to do so? Nah. I mean Your Name is just as good if not better than a Miyazaki film, but their styles can’t even be compared. Also, Shinkai doesn’t have Disney’s support for global distribution. Shinkai will never develop the international reputation of Studio Ghibli films, no matter how good he gets. I finished watching the movie yesterday and I was trying to figure out how to review the movie without spoiler. The analogy of online friends was intended as you said, but I couldn’t stop thinking this movie is about how we really don’t forget someone as long as this person reached us. I mean even if we can’t remember the name or the face there will be something like a scent, a song or a novel which will makes us feel nostalgic towards this someone without knowing. This is the way I saw it, I don’t know if I have explained myself well. I enjoyed a lot this movie and the best thing was I didn’t expect to. It was an interesting entry. P.D: Sorry if there are any spelling or grammar mistakes. I am not a native english speaker. Was finally able to watch the movie for myself, and I watched it twice; yesterday and today as of this post. I enjoyed it just as much both times and cried while watching it the second time. It’s this kind of storytelling that I want to learn and develop for myself; such a beauty. 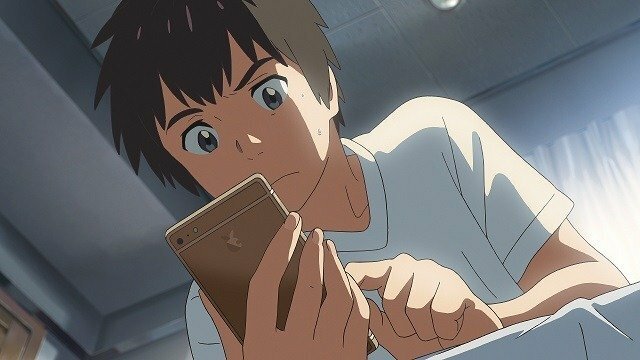 So loved, and Your Name is probably my favorite anime film ever now – and its competing with my favorite anime ever now as well. Might go watch it again later. I’m not gonna be able to watch anime for a while now. Haven’t had a void for a while now or a good romance. I am so glad to hear that you liked it!